Days after President Barack Obama lashed out at British Petroleum (BP) saying he would not let them ‘nickel and dime’ his people in the oil spill case, a sessions court in Bhopal did precisely that with the victims of the world’s worst industrial disaster. After 25 long years the court of the chief judicial magistrate pronounced its verdict on the criminal case against Union Carbide and its Indian subsidiary on the matter of negligence and liability. The court’s decision holds seven officials of Union Carbide India guilty, but on diluted charges of accidental injury—tantamount to a traffic accident—and lets off the main accused of the US parent company. Universally called a travesty of justice, the verdict has, however, been welcomed by the US government. It believes the verdict now puts to rest all cases against its ‘unfortunate’ victim company, Union Carbide. There is no doubt this is one case where the victims have been let down completely by the Indian State—government and judiciary. It is no small matter the Union law minister admitted as much, saying sadly “justice has been buried in the Bhopal case”. It is well accepted the Supreme Court erred badly first in 1989, by settling all civil and criminal liability at a piddly sum of US $470 million (in 1991 it reopened the criminal case). Then in 1996, the apex court reduced criminal charges from section 304b—culpable homicide with a maximum punishment of 10 years—to a milder section 304a, used in traffic accidents for deaths caused by rash or negligent acts, which limits the term of imprisonment and provides for lighter fines. In all this, the court has been strangely silent about the management of relief and the lack of medical research and treatment for the victims. The apex court, known to side with environmental victims, has also been vacillating on the matter of what should be done with the abandoned factory site, which is full of toxic contaminants the company left behind. The trial court has only compounded and sealed these errors—with a judgment that is hurting victims even more (if possible) than the deadly and horrific night when the city died a million deaths. Bhopal is about shame. 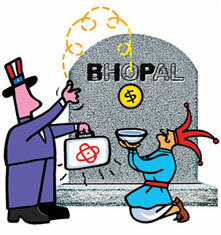 Bhopal is also about what the country, indeed all countries, must do about corporate liability for the unknown. In 1984, when the pesticide factory’s poison gas hit Bhopal, to kill and maim thousands, nobody had seen or imagined a disaster of this kind. The question of liability was hushed up, largely because it involved a US company. Nobody wanted to mess around with this corporate powerhouse, even in those times of relative innocence. The amount settled for the disaster, still unfolding because lives continue to be lost and ailments do not go away, was less than what was agreed in the Exxon Valdex case that occurred a few years later in 1989. In this oil disaster, which hit the coast of Alaska in the US, the toll on the natural environment— the flora and fauna—was priced double (some US$ 1 billion settled for punitive and economic damages) that paid for the thousands of human lives lost and maimed in Bhopal. But oil interests in the US are not small fry. In 1990, post-Exxon Valdez, the Oil Pollution Act was passed. The act capped the liability of economic damages from such an oil disaster at a mere US $75 million. Today, even as the US is learning how it never anticipated a disaster such as the BP spill—a leak in an oil well so deep in the ocean that human intervention is not possible—this cap has become a point of friction in the country. Today, the US Senate wants the cap removed. Otherwise it will have to prove that BP’s oil spill was the result of deliberate and gross negligence and/or regulatory non-compliance. The US Senate knows this will be difficult to establish, given the country’s legal process. The country’s president also says it is not regulatory noncompliance, just that regulations have been played around with and diluted because of the ‘cosy relationship between big oil and government’. This is the right time to ask the Indian government to rethink the Civil Liability for Nuclear Damages Bill it wants to present in Parliament. The bill caps the operator’s liability at Rs 500 crore per incident, with additional damages of approximately Rs 2,300 crore to be made good by the government. This amount is even less than what was paid in the case of Bhopal, a ridiculously low amount; this amount is a joke when it comes to a nuclear accident. US companies with an interest in the nuclear business desperately want India to pass this bill. It will cap liability and hence reduce their insurance cover and costs. It is, thus, not a surprise that the official US response to the trial court judgment on Bhopal mentions this bill and wants the Indian government not to link the two. But there is a link. The issue of liability must be established and it must be based on full costs. Only then can we believe the corporations that want to sell us these future and unknown high-risk technologies. After the shame of Bhopal, nothing less is acceptable.